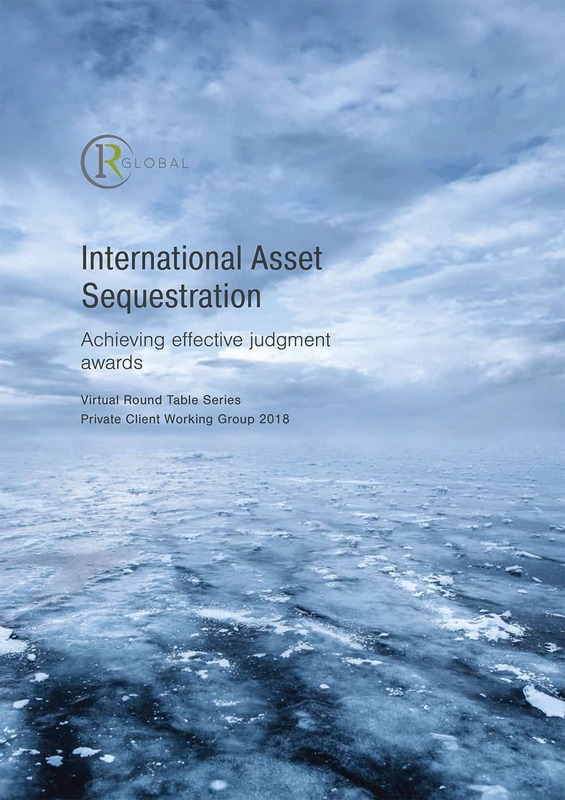 for the sequestration of assets before a judgment is entered and, if it does, what are the circumstances under which a sequestration order would be entered? China – Jian Zhang (JZ) In China, we also have pre-judgment sequestration procedures. For every request, you need to first of all provide evidence that you have a case and then place a bond in court of 30 per cent of the value of the disputed or sequestered amount. You can use a local guarantee company, for a fee of 1 per cent of the value you want to seize. Use of a guarantee company satisfies the bond requirement. Normally when we file the case, we should present all the evidence at the end. At the same time, we ask the court’s permission to grant a sequester order so that the defendant is not judgment proof. Taiwan – Juan Madrigal (JM) In Taiwan, a plaintiff is able to petition for the pre-judgment attachment of a defendant’s bank accounts and other assets. This can be done before a lawsuit is filed, on condition that the plaintiff is able to show a strong case. When petitioning for pre-judgment attachment, a plaintiff needs to prove that it would be impossible or extremely difficult to collect the claimed amount from the defendant. Even though it’s a two-step process, we recommend you file a petition and a lawsuit at the same time. When not filed together, the court will, upon motion of the defendant, order the plaintiff to file a lawsuit in Taiwan to validate its claim within a certain period (usually 7 days) after the assets are attached. The plaintiff’s failure to institute the litigation against the defendant within the prescribed period will result in the lifting of the pre-judgment attachment. There is no such concept as fraudulent conveyance in Taiwan, so the defendant is free to move their assets until a judgment is obtained, or a pre-judgment attachment is granted. This means any sequestration must be applied for at the earliest opportunity. The plaintiff is also required to pay a bond, which can range from 30 – 100 per cent of the claim, at the discretion of the judge but is usually 33 per cent of the claim. This can be paid in the form of cash or a certificate of deposit (CD). It will be deposited with the court and will only be refunded to the plaintiff in specific circumstances. In addition to the bond, the plaintiff must pay an execution fee equivalent to 0.8 per cent of the claim amount. Is there a requirement for a defendant to be notified about a sequestration judgment in your jurisdiction? China – JZ It is the same in China. The court is required to give notice to the defendant, and the defendant has a chance to appeal that order. Any appeal would not block the process of the sequestration order though and the court could include the defendant’s bank account, real estate or any stocks the plaintiff owns. On the one hand, they notify the defendant, but on the other hand, they carry out the sequestration measures immediately. All sequestration orders require a bond, so if there are any mistakes made by the court, the plaintiff would be liable for any losses suffered by the defendant due to wrongful seizure or freezing actions. Taiwan – JZ If the plaintiff can provide the convincing evidence to show there are difficulties to collect the claimed amount from the defendant, the judges will enter an order of sequestration without notifying the defendant. If it is granted, the plaintiff should enforce the order of sequestration within 30 days. Then it is up to the plaintiff to take that pre-judgment attachment order to the tax bureau to obtain a list of assets recorded in the defendant’s name. They must then go to each individual bank, property registry or government agency to enforce the attachment. The defendant will not be notified until the assets are seized. When the defendant receives a sequestration order, he can file an appeal against the order, (any appeal would not block the process of the sequestration order) or provide a bond, determined by the judge and recorded on the sequestration order (usually total amount of the claim), to lift the sequestration order. Almost all sequestration orders require a bond provided by the plaintiff. If there are any mistakes made by the court, or the order is lifted due to failing to file the lawsuit within the certain period, the plaintiff would be liable for any losses suffered by the defendant due to wrongful seizure or freezing actions. How can the priority of a judgment be preserved in your jurisdiction? Taiwan – JZ All judgments are public record and there is no need to register them. They do not create a lien on the assets and this is one of the reasons that we recommend clients obtain a pre-judgment attachment. If the plaintiff prevails and there is a monetary award, then the defendant has to pay for the assets to be liquidated. If it turns out that the defendant has no assets, then the judgment technically retains its value for ever, until repaid, but it has to be recertified with the local court every few years. The timing differs depending on the nature of the claim though, whether it is a promissory note or a commercial transaction, for example. The recertification timings can vary between 3-15 years and can be extended indefinitely. The assets owned by the defendant at the time of judgment are attached, however if after the judgment is issued, the defendant opens a new bank account, that will not be monitored by anyone so the plaintiff has to check for new assets periodically. Taiwan is not a signatory to the Hague Convention on foreign judgments, but generally adheres to the reciprocity principal. If your jurisdiction enforces Taiwan judgments, then a Taiwan court will enforce a judgment from your country, providing it does not go against public policy. China – JZ In China, like in Taiwan, our judgments are public record, so there is no need to register a judgment. We do have a recent development designed to better enforce judgments, however, that is worth highlighting. In China, 40 per cent of judgments are not enforceable and a lot of debtors try every means possible to avoid the debt. The Supreme Court has created a central list of all those debtors who are unable to pay the debt. They are then fed into the system as discredited persons, which includes the company itself, as well as the legal representative. The person listed will not be able to take airplanes, or high speed trains or stay in luxury hotels. There will also be a travel ban outside China. It’s a strong weapon that the court uses to enforce judgments here. In terms of the life of the judgment, it’s forever until the debt is repaid. Foreign judgment acceptance is based on the reciprocity principle, so if a foreign country enforces Chinese judgments then China will do the same. Recovery against a closely held business entity is similar to the piercing of the corporate veil principle. It is applicable in China if the plaintiff can prove that the defendant has used the corporate shell to hide their personal activities and used the same bank accounts to facilitate payment. The court would then be able to pierce the corporate veil and enforce against the actual person in control. The personal assets of that individual would then be included in a corporate dispute.